You will receive an e-mail alert when the price of Metro Exodus will drop. 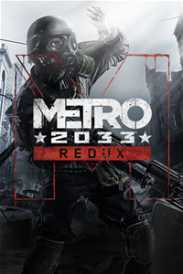 Buy Metro Exodus before 15th March 2019 and also receive a digital copy of Metro 2033 Redux. Embark on an incredible journey - board the Aurora, a heavily modified steam locomotive, and join a handful of survivors as they search for a new life in the East. Experience Sandbox Survival - a gripping story links together classic Metro gameplay with new huge, non-linear levels. A beautiful, hostile world - discover the post-apocalyptic Russian wilderness, brought to life with stunning day / night cycles and dynamic weather. Deadly combat and stealth - scavenge and craft in the field to customize your arsenal of hand-made weaponry, and engage human and mutant foes in thrilling tactical combat. Your choices determine your comrades’ fate - not all your companions will survive the journey; your decisions have consequence in a gripping storyline that offers massive re-playability.